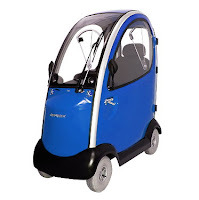 Wow, if I were filthy rich I'd definitely go buy myself one of those mobility scooters like this Shoprider Flagship. Who needs Segway? Those are old school and besides, you ride it standing up so your precious little feet still get tired. With the Shoprider Flagship, you get to rest your legs plus you're also enclosed safely so no need for safety helmets. Price is outrageous though at $6,999.